A fun game to play with literate friends is making up words for things that need to be named. Once on a long car trip some friends and I came up with one that we’ve held on to: “mistalgia” — the longing for a past you never had. I was born in 1974 and have developed a serious case of mistalgia for the early ’70s. Mistalgia is often barely distinguishable from retro — in my case, I’ve grown shaggy hair and am even attempting a beard, I feel at my best wearing corduroy or jeans and western shirts, and I’ve been listening to a lot of Kris Kristofferson, although I admit most of what I know about the period comes from Robert Altman (R.I.P.). Gyres being what they are, though, we can from time to time relive our mistalgic pasts as more than fashion statements and movies. And 2007 is shaping up to be a serious early ’70s thing, man. I submit to you, I am secretary of defense and I am responsible for lives and I am not about to recommend the loss of American lives in relation to those targets. . . The destruction of all of them would not make any material difference in the war, and that is my only point. It was [hawkish Senator W. Stuart] Symington who cut to the quick of McNamara’s testimony. During the lunch break of the hearing, the senator went right to the reporters in the corridor. He said that if the secretary of defense was right in contradicting the Joint Chiefs [who had said that more bombing would bring victory], then the war was lost, and the United States should get out of Vietnam “at the earliest possible time.” This meant defeat and disgrace. In fact, it was a fair characterization of McNamara’s true position, but it was not one to which the secretary was remotely ready to admit. When the hearing reconvened, McNamara retracted his statement. The damage was done to McNamara’s career — he left his post a couple of months later to run the World Bank (hello, Wolfowitz! ), having lost faith in the war and let that slip in public. But Symington and the hawks — and the bloody war itself — had won a victory in discrediting McNamara, and the war continued for another six years. Richard Nixon did end the Vietnam War, of course, though without honor, and five years after taking office with a “plan” to end the war that never materialized. Instead, Nixon adopted a policy of “Vietnamization,” trying to get the South Vietnamese government and military to take over responsibility for the regime’s own security as U.S. forces were drawn down. The wonderful thing about Vietnamization was that it freed the U.S. from responsibility when things went badly. Setbacks could be blamed on the feckless, corrupt, factionalized, cowardly Vietnamese, while the gradual U.S. withdrawal nobly sought to uphold the sovereignty and democratic wishes of the South Vietnamese people. Nixon played a wink-wink game with the American public, who, weary of the war, were willing to abandon an ally as long as it wasn’t called abandonment. Our current situation is in many ways quite unlike Vietnam, and the early ’70s period of the Vietnam War in particular. Iraq has moved much more rapidly into the fiasco stage; Bush, unlike Nixon, is both the originator of the fiasco and its inheritor; Bush has less integrity than Johnson, the flawed man who escalated Vietnam, and probably less than Nixon; there is no draft in the United States, and the size and tenor of protests against the war are different. History never really repeats itself; only its tellers do. But it feels familiar in at least one key respect: the war marches grimly forward, corpses in its wake, even though more and more people at all levels of society and power realize it must end, that victory is impossible. Its advance is freakish, like the Terminator’s: Why won’t the damn thing die? War may have its own unique horror among human pursuits, but it is all the more terrifying for also displaying the same dynamics as any other bureaucratically directed policy initiative. The same inertias, the same surprising turns, but most of all the same relentless drive to self-continuation, even expansion. Plans are offered, sounding suspiciously like plans that have been offered before. “We shall have benchmarks!” although the benchmarks sound suspiciously like benchmarks we’ve previously set. In a replay of the rhetorical logic of Vietnamization, the administration speaks as if the Iraqi government could possibly meet these benchmarks even if it wanted to; when it doesn’t, it will be the fault of those feckless Iraqis, who can’t even be bothered to save their own country. Worst of all, more troops are to be sent, although nobody but the lunatics who pushed the war in the first place believes they will “make any material difference in the war.” The hawks (Fred Kagan, John McCain) now argue that an escalation of 20,000 isn’t enough, that we need 40,000 more, or 300,000. Their asses are covered for the future, when this escalation is seen as a mistake. Despite some noises from Congressional Democrats recently about accountability, to which insider Washington journalists give too much credibility, it doesn’t seem that Bush — and thus the war — can really be stopped. “War Could Last Years, New Commander Says,” read yesterday’s headline. Joe Biden, who probably (tragically) represents the leftmost limit of what the Democrats are willing to do on foreign policy, told Tim Russert on Sunday that there’s little to nothing Congress can actually do to change Bush’s conduct of the war: “He’ll be able to keep those troops there forever constitutionally if he wants to.” You and I might disagree, but we’re not senators with fancy hair and presidential aspirations now, are we? There remains, finally, the question of moral seriousness. The “surge” that will be proposed this week is a response to domestic political realities, a desperate attempt by a failed president to avoid responsibility for his fuckups, aided and abetted by other politicians, pundits, and bureaucrats, civilian and military, who care about nothing other than smelling like roses when the shitstorm finally ends. To all of them, one question: Since you don’t believe, when you stop spinning, that your new plan or any other plan can bring victory, since you hesitate to even define victory because any definition at all sets the bar unachievably high, how dare you ask another soldier or another innocent Iraqi to die for a mistake? Kind of takes the fun out of that early ’70s mistalgia, doesn’t it? A US soldier stands guard at a rubbish dump where the bodies of four Iraqi males were discovered. 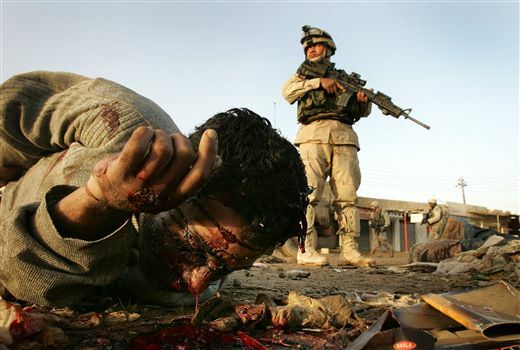 The men were members of the Iraqi National Guard and had been kidnapped and assassinated by insurgents. Ramadi, 2005. Photo by Jason P. Howe. My truest case of mistalgia has always involved the late 1960’s brought back from the dead as they were from the 40ish boomer media types that had lived them 20 years earlier in that round of 20th anniversary events that was part of the 1980’s. Gosh it all looked so fun and carefree and cool. Nothing like the Reagan era. But then in college I took a very “po-mo” class on the history of Rock-n-Roll. Taught by a 50ish boomer academic type who continally made the point that the late 1960’s wern’t all that much fun. In fact, it was scarier than sh**. 6 years ago I think we all got a sense of what it feels like to live in a revolutionary moment. On one hand there is SO much going on culturally, massive, radical change, fun, even. And on the other there is the looming sense of dread. Well . . . keep your fingers crossed. Dave, a great post as always — you know I’m your biggest fan. Yes, the greatest tragedy is that smaller fish will continue to die for the mistakes of bigger ones, and the media will continue to swim in circles. I wish there was something more insightful or witty I could say about the subject of your post, but I guess I’ll just call a spade a spade: the whole deal’s a bummer man. On a lighter note: Dave, we are not yet home, but we are leaving for the airport in about an hour. It was great to meet you and all the other ECers. Thank you to all for making Steph and me feel so wonderfully at home; we really had one of the best vacations of our lives. Dave, thank you for continuing to share your voice against this war. It’s haunting to think about what’s been happening, and so, like many I stay in a sick sort of denial, and yet, you keep plugging away at encouraging us to look–a constant force for remembering and acknowledging and stopping what’s happening, which I find inspiring. I do feel it’s hard to figure out where to stand up though–I voted…now what? what is the average person supposed to DO now? when will the tide change? doesn’t bush hear the people at all? There’s a church up in the Village that posts up the number of deaths in the war, Americans and also Iraqi/civilians. It’s chilling. Thanks for your continued trenchant writing and thinking on what’s going on with this war. In other news, Sunni insurgents have spoiled Bush’s announcement of a ‘surge’ by going ahead and surging all by themselves before we can. These people don’t even follow the laws of publicity and marketing! First you you leak what you’re going to say you’re going to do, then you say what you’re going to do, then and only then do you do what you’re going to do. Is nothing sacred? Sorry to veer into the facetious, but it’s very difficult for me to handle speaking or writing about the war without resorting to some sort of forced dark humor. Thanks, Dave, for your straightforward, earnest, and honest writing. It gives me heart. As for ‘mistalgia’ – great word! Maybe you need to write up a wiki entry for it. Also, you may have read it already, but Deleuze and Guattari’s “War Machine” chapter in A Thousand Plateaus will surely be of interest to you. NPR had a great piece on yesterday about the administration’s choice of the word “surge” to describe its request/demand/plan for adding more troops to this war. “Surge,” Deborah Tannen suggested, has positive connotations, like a surge in electricity or a surge of feelings. It would seem that we, then, are the true insurgents into a foreign country, into this war. Lane: The whole “may you live in interesting times” thing, etc. I have the feeling things will get a lot more interesting soon, curing us of whatever mistalgia we have left. Scott: Sorry to see you leave these shores, and to have missed last weekend. Is there any way of making Rocky President? “Cause he’d be way better than this guy. MFan: Sorry about the riptide thing. I’m trying out a slightly different approach to these political screeds of mine. So in general, when I start an essay talking about pleasant things like flowers and puppies, be afraid of the paragraphs to follow. ssw: I know, what to do is always the question. The elections were great, but now the election results need to translate into policy changes. The cheesy, but I think slightly effective, thing would be to write your representatives and tell them to use Congress’s power of the purse to put an end to U.S. involvement in Iraq. Congress has done this before, even though Joe Biden would rather forget about it. Tim: As I was brushing up on my Vietnam War history yesterday in preparing this post, I was struck by something in a Wikipedia entry. As U.S. forces in SE Asia escalated to more than 400,000 troops, according to the article, the North Vietnamese and Viet Cong were able to match the escalation every step of the way with more troops and materiel. I’ll check out the chapter — I am woefully under-read. WW: Tannen makes a good point. The other thing about a surge is that it’s temporary. If Bush announces a firm and limited timetable for drawing down the new troops, it’s a surge. If not, it’s an escalation.